Story: Beatrix Potter has delighted generations of children with her books. But she kept her own private life locked carefully away. 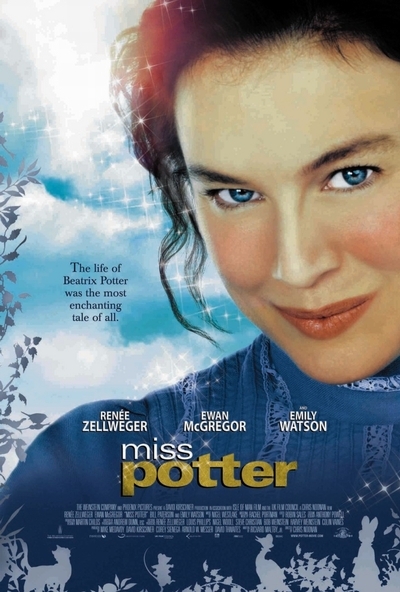 Oscar-winning star Renee Zellweger is now bringing her secret story to the screen in "Miss Potter," the first film directed by Chris Noonan since his charming 1995 movie, "Babe." It is set in the high summer days of late Victorian and Edwardian England, during which Beatrix develops her natural skills as artist and story-teller. When she finally publishes her debut book, "The Tale of Peter Rabbit," she becomes a writing celebrity. It also leads to courtship and her first love with publisher Norman Warne, played by Ewan McGregor. Their relationship and his marriage proposal in July, 1905, was to change Beatrix's life for ever. It was a love which she could not announce - or even talk about. In high-society London, her parents had insisted she keep it from friends and neighbours. They considered her proposed wedding a mismatch. Warne, they said, was from 'trade' and demanded that she carefully reconsider their life together. Beatrix allowed herself to be persuaded to leave her fiance and London. It was supposed to be a time for reflection and calm. But, instead, she faced tragedy and loneliness and returned, with a different outlook. She became a woman of strong views and independence. She also built up a farming dynasty in the Lake District - a dynasty over which she took charge long after her writing career virtually ended in 1913. It established her as a woman ahead of her time. Despite becoming the world's most successful children's writer and a wealthy landowner and prize-winning farmer, she never forgot her first love.